Normally when I write about Georgia, it’s to wax poetic about the Glorious Bulldogs. But I’m currently in Tbilisi, the capital of the nation of Georgia, which is wedged between Russia, Turkey, Armenia, and Azerbaijan. So allow me to take this opportunity to highlight the benefits of sweeping pro-market reform. 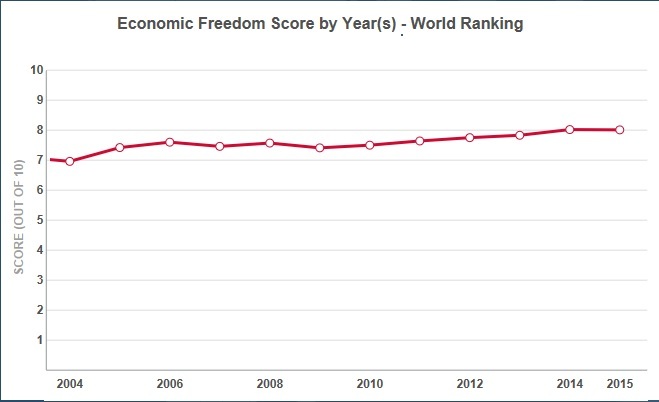 Georgia is ranked #8 according to Economic Freedom of the World and it doesn’t get nearly enough attention considering that lofty score. This chart from EFW shows Georgia’s score since the reform wave started in 2004. The fact that Georgia’s score jumped by one full point over 11 years is impressive, but it’s even more impressive to see how the country’s relative ranking has increased from #56 to #8. Here are the numbers for 2004 and 2015. As you can see, there were particularly dramatic improvements in trade, regulation, and quality of governance (legal system and property rights). My friend from Georgia, Gia Jandieri, said one of the worst legacies of Soviet rule was corruption. He and his colleagues at the local pro-market think tank explained to policymakers that reducing the size and scope of government was a good strategy to address this problem. 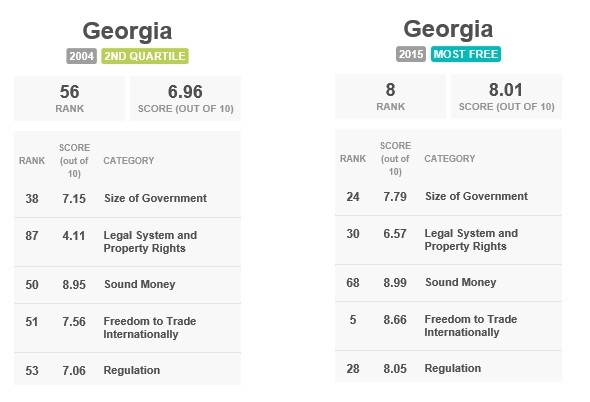 Georgia was ranked near the bottom by Transparency International in 2004, scoring just a 2 (on a 1-10 scale) and tied for #133 out of 146 nations. Now Georgia’s score has jumped to 56 (on a 1-100 scale), which puts it #46 out of 180 nations. And a big reason why corruption has plummeted is that you no longer need all sorts of permits when setting up a business. 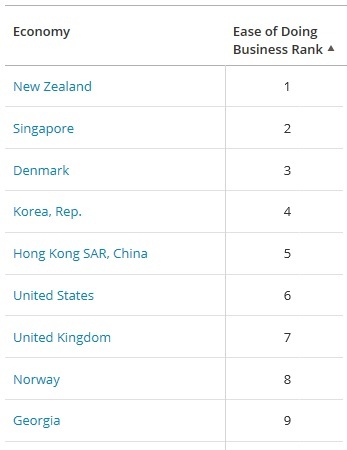 Indeed, Georgia ranks #9 in the World Bank’s Ease of Doing Business. For what it’s worth, Georgia is only three spots behind the United States (the previous year, they were eight spots behind America). And I definitely shouldn’t forget to mention that Georgia is part of the global flat tax revolution. So what does all this mean? Well, according to both the IMF data and the Maddison database, per-capita GDP in Georgia has more than doubled since pro-market reforms were enacted. In other words, ordinary people have been the winners, thanks to a shift to capitalism. P.S. 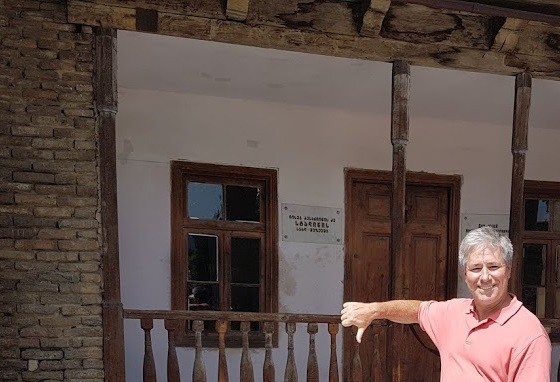 Since I just wrote about my visit to the anti-Nazi/anti-Marxist House of Terror Museum in Budapest, I should mention that the “lowlight” of my visit to Georgia was seeing Stalin’s boyhood home earlier today. I realize “thumbs down” is a grossly inadequate way of expressing disapproval for a tyrant who butchered millions of people, but I didn’t want to get arrested for urinating in public. I wonder if Hitler’s boyhood home still exists? I could visit and then say I covered both ends of the socialist spectrum. Hopefully, the example of Georgia serves as a template for Ukraine. Both countries were on the losing end of Putin’s aggression and lost valuable and productive land and population to Russia. While Georgia rebounded, Ukraine was sinking deeper. Unfortunately, the saga of Saakashvili isn’t impressing a lot of confidence in this regard. Although that’s not enough and we need don’t ble digit growth of the economy .. during the next 20-30 years. Cut taxes, spending and regulations. Sometimes people ask – if Georgia is so good why it is still poor, why it is not growing fast. My answer is – lack of regional cooperation. Georgia needs to counterbalance the risks and the deficits with more radical steps, radically cutting further tax rates, govt spending and regulations. Only this way it can achieve very much needed double digit growth for the next decades. This is must.